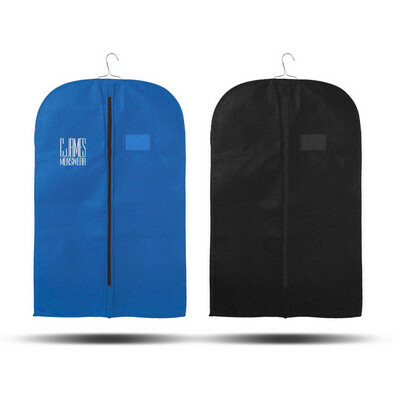 Strong yet lightweight garment bag which is manufactured from 80gsm non woven material. It has a zippered closure along with an ID holder and is ideal for protecting suits and garments whilst travelling. A lead time of 10-15 working days applies to this product. Colours: Royal Blue, Black. Dimension: W 584mm x H 990mm. Print Description: 127mm x 152mm. Print Type: Screen Print. Packing: Bulk. Less than minimum quantities are not available for this item. Large cotton laundry bag with a drawstring closure and a front slip pocket. A lead time of 10-15 working days applies to this product. Colours: Natural, Red, Royal Blue, Black. Dimension: W 495mm x H 645mm. Print Description: 108mm x 152mm. Print Type: Screen Print. Packing: Bulk. Less than minimum quantities are not available for this item. 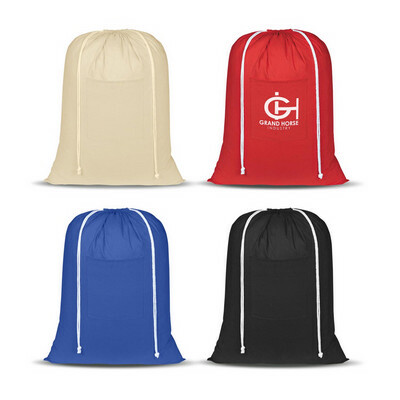 Laundry bag with a drawstring closure which is manufactured from a combination of soft nylon mesh and 210D polyester. A lead time of 10-15 working days applies to this product. Colours: White/Red, White/Burgundy, White/Lime Green, White/Forest Green, White/Royal Blue, White/Navy, White/Purple, White/Black, Black/Red, Black/Lime Green, Black/Royal Blue, Black/Black. Dimension: W 560mm x H 790mm. Print Description: 203mm x 102mm. Print Type: Screen Print. Packing: Bulk. Less than minimum quantities are not available for this item. 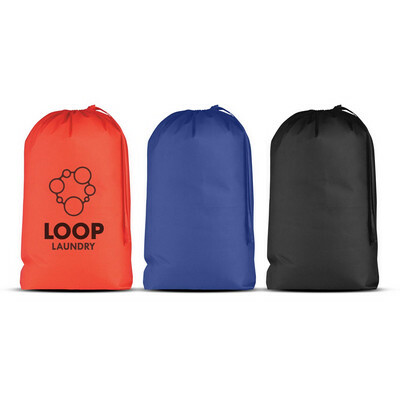 Affordable laundry bag with a drawstring closure which is manufactured from 80gsm non woven material. A lead time of 10-15 working days applies to this product. Colours: Red, Royal Blue, Black. Dimension: W 460mm x H 673mm. Print Description: 254mm x 254mm. Print Type: Screen Print. Packing: Bulk. Less than minimum quantities are not available for this item. 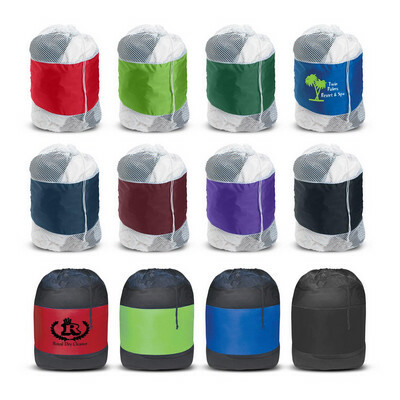 Five litre waterproof carry bag which is designed for use in the outdoors and around water. It is manufactured from 210D ripstop nylon with a waterproof laminate and it has a secure roll top closure with a handy hook. It will float in water and can be relied on to keep electronic items and valuables etc. dry in all conditions. A lead time of 10-15 working days applies to this product. Colours: Red, Lime Green, Royal Blue, Black. Dimension: W 275mm x H 360mm. Print Description: 178mm x 178mm. Print Type: Screen Print. Packing: Bulk. Less than minimum quantities are not available for this item.